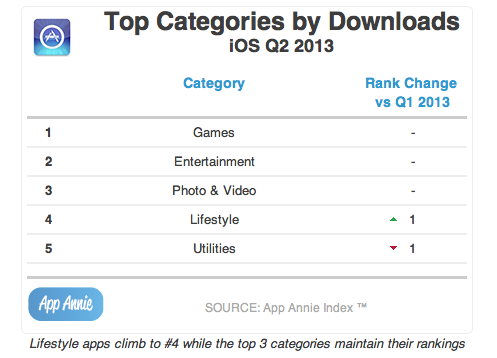 AppAnnie reports that Google Play has finally surpassed the App Store in terms of downloads by 10% during the second quarter of 2013. 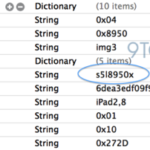 If we look at the number of activated devices, we can say it is about time: 900 million Android activations vs. 600 million iOS device activations according to the latest available data. But the interesting part comes just now: despite becoming a leader in terms of app downloads, the App Store also leads the market in terms of mobile monetization. In other words, iOS users are more willing to pay to get content than Android users. 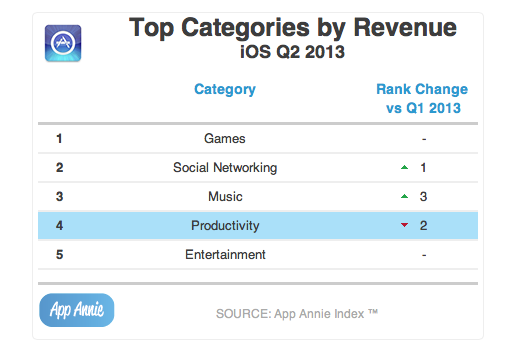 To put that into numbers, iOS app revenue was 2.3 times the Google Play app revenue, according to AppAnnie’s index. Turns out gaming is still the dominant category in the App Store, accounting for about 40% of all downloads in the second quarter of 2013. Photo & Video took third place. As the download stats already suggest, games continued to dominate the iOS App Store revenue during the same time period, accounting for about 75% of total App Store revenue, up from 70% recorded the prior quarter.